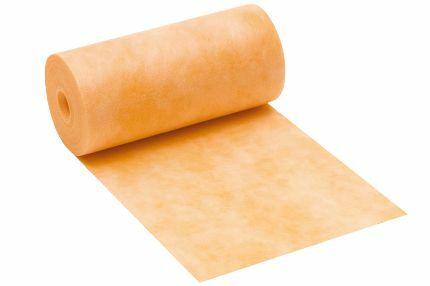 Schluter®-KERDI is a pliable, sheet-applied, bonded waterproof membrane and vapor retarder with limited crack-bridging capabilities. KERDI features a modified polyethylene (PEVA) core with non-woven polyproplyene on both sides to anchor the membrane in the thin-set mortar. KERDI was developed as a waterproofing membrane to be used in conjunction with ceramic and stone tile coverings. Tiles can be installed directly on KERDI using the thin-bed method. Other trowel-applied covering materials, such as plaster, can also be used. 1. The substrate must be clean, even, and load bearing. The thin-set mortar used for bonding KERDI must be appropriate for the substrate, and it must penetrate and engage the KERDI fleece. 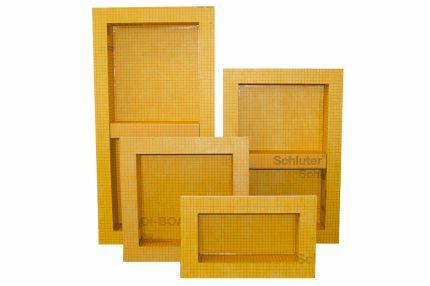 Generally, Schluter-SET, Schluter-ALL-SET, Schluter-FAST-SET, or unmodified thin-set mortar is used. Cut KERDI to size prior to application. 2. Apply thin-set mortar to the substrate using a 1/4" x 3/16" (6 x 5 mm) V-notched trowel or the KERDI-TROWEL, which features a 1/8" x 1/8" (3 x 3 mm) square-notched design (Note the open time of the mortar). Press KERDI fully into the bond coat. Work the KERDI into the mortar by applying pressure to the membrane with the flat side of the trowel (held at an angle) in smooth, diagonal sweeps. Air bubbles must be avoided. 3. 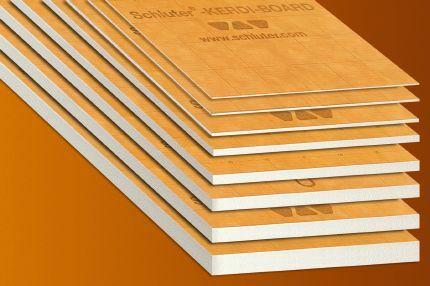 Seams can be constructed by overlapping the edges of the KERDI 2" (5 cm) using Schluter-SET, Schluter-ALL-SET, Schluter-FAST-SET, or unmodified thin-set mortar, or by abutting the edges and covering the joint with KERDI-BAND using Schluter-SET, Schluter-ALL-SET, Schluter-FAST-SET, or unmodified thin-set mortar. 4. For inside and outside corners, adhere pre-formed KERDI-KERECK-F corners. For floor/wall connections, use KERDI-BAND. Install KERDI-SEAL-PS pipe seals at showerhead, body sprays, etc. and KERDI-SEAL-MV at the mixing valve. 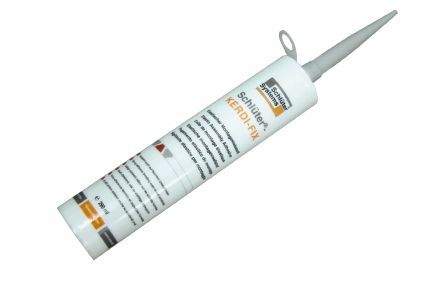 As an alternative to KERDISEAL- PS/-MV, KERDI-FIX or other suitable sealant can be used to seal pipe protrusions and protect moisturesensitive solid backing panels at the mixing valve. 5. Connections to fixed building elements can be achieved by using KERDI, KERDI-BAND, or KERDI-FLEX in conjunction with KERDI-FIX, suitable trowel-applied waterproofing materials (such as urethane or similar), that require atmospheric moisture to cure, or other suitable sealing compounds. 6. KERDI shall be separated at existing expansion, structural, and flexible edge joints. Cover the joints with KERDI-FLEX. 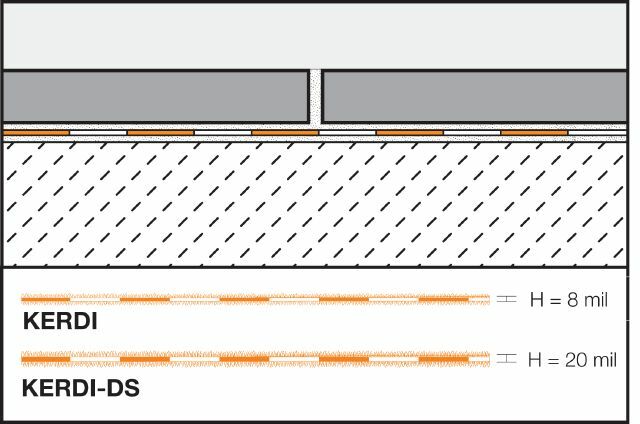 To allow for greater movement, the center section of the KERDI-FLEX can be tucked into the cavity of the expansion joint prior to bonding. 7. Once the entire membrane—with seams, corners, and connections—has been completely bonded, and therefore waterproofed, the covering may be applied. Prior to setting tile, wait 24 hours to allow for final set of the mortar before testing to ensure waterproof performance of the assembly at seams and connections. 8. For tile installations using the thin-bed method, apply Schluter-SET, Schluter-ALL-SET, Schluter-FAST-SET, or unmodified thin-set mortar directly to the exposed KERDI surface and install the tiles, ensuring full coverage. For acid-resistant coverings, use an epoxy adhesive to set and grout the tile. 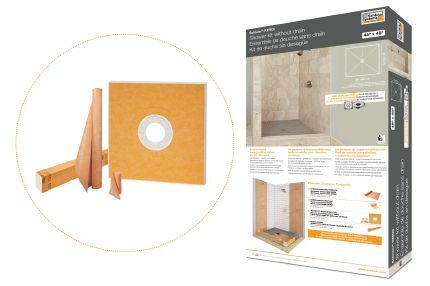 For complete installation guidelines and warranty criteria for KERDI in showers, steam showers, and bathtub surrounds or KERDI-DS in steam rooms , please download the Schluter®- Systems Shower System Installation Handbook and view the installation videos available below.